Doplňujte energii a spalujte tuky! The SiS GO Gels + Carnitine builds on the established science of the Go Gels by not only delivering a rapid supply of easily digestible carbohydrates (20 grams per gel) for energy but also, providing 1 gram of carnitine per gel. It has also been believed by scientists that increasing our muscles’ store of carnitine is now considered as one of the most effective methods to increase fat metabolism during prolonged moderate-intensity exercise. Proč bych měl vzít tento gel? In order to achieve high rates of fat utilization during exercise, carnitine is required to help transport fat into the mitochondria, the muscle’s powerhouse where we burn fat for a fuel. During prolonged exercise and periods of high-intensity exercise, carnitine stores can become reduced meaning we have to increase the use of carbohydrate as a fuel, which can lead to fatigue. Fortunately, increasing the carnitine stores in the muscles before exercise ensures we can increase fat utilization therefore effectively sparing the use of our limited carbohydrate stores for later use during exercise. As such, we now have more carbohydrate available for when we really need it such as those hard parts of the training session or race. 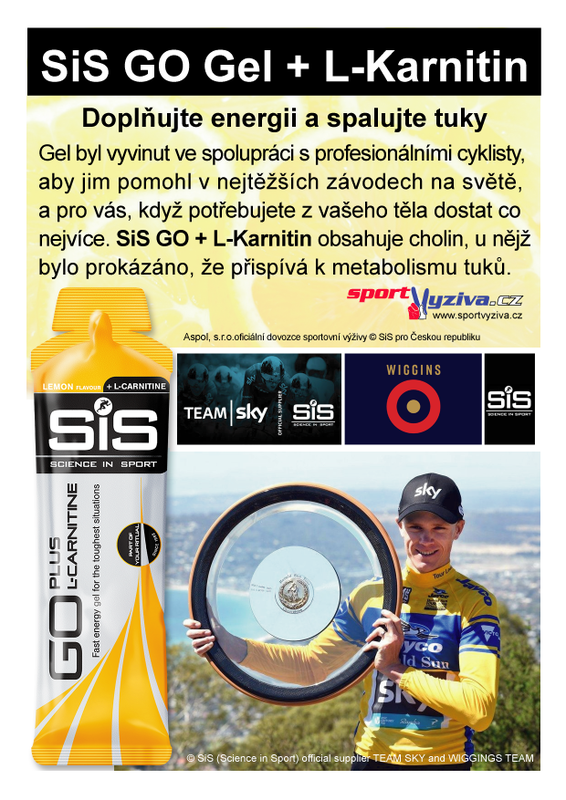 The use of SiS GO Gels + Carnitine is especially beneficial for prolonged training sessions or races where exercise will last two hours or more. To achieve the beneficial effects of the SiS GO Gels + Carnitine, you should consume 1-2 gels daily either at rest (such as with or between main meals) or during exercise. Where you are training to compete in a specific endurance event, consume this daily dose for 4-8 weeks prior to competition. Given that the SiS GO Gels + Carnitine is to be consumed in the days leading up to your event, you should also ensure that you consume other carbohydrate, hydration and caffeine products of the SiS GO Range on race day in order to ensure maximal race day performance.